A big bowl of fresh, leafy greens–anything of the lettuce or spinach variety, even a mixture– always seems simple to me and I find it incredibly refreshing. I can go minimalist with my meal or I can dress it up any darn way I please, even getting a bit fancy with it. Sems kind of ironic now that I think about it. I mean typically, we’re all about dressing down in the summer with less being more due to the heat but the opposite is true for this kind of meal. Everything is so cool and crisp that layering on the different textures and flavors doesn’t add up to heaviness, but to something that’s more robust and even more satisfying in it’s raw, uncooked simplicity. Like wise I didn’t bother weighing this salad down with any heavy, creamy, or leave me feeling greasy dressings. 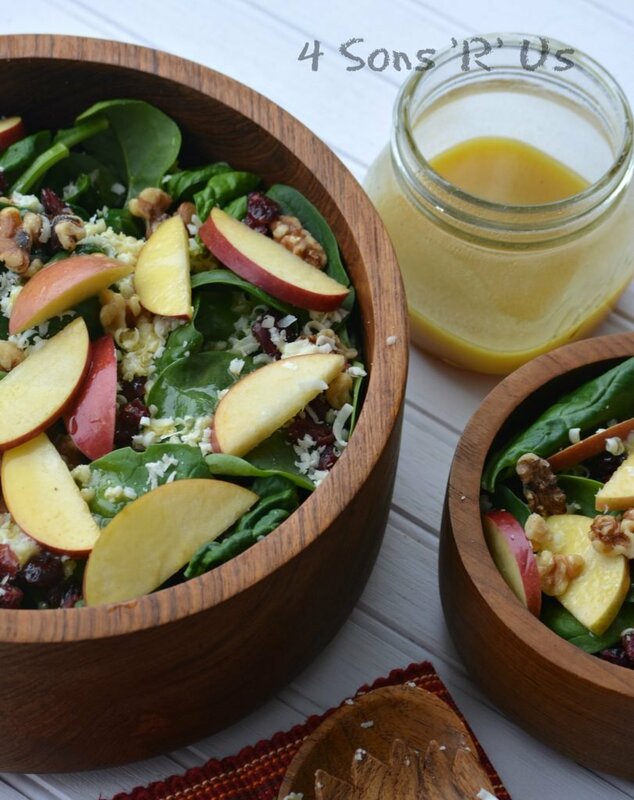 Just a simple sweet honey flavored vinaigrette. It’s also got a bit of tang from apple cider vinegar and a few spoonfuls of savory from your favorite mustard. The toppings follow along the same lines– loads of texture, and a mix of tantalizing flavors. Want to add in a little something extra to make it a heartier meal, or slightly more savory perhaps? Pulled rotisserie chicken fits right in with this cast of characters like it was meant to be written into the script. As the weather grows warmer, it just seems right that meals should head in the opposite direction. Who wants to sweat over the stove, or be stuck inside weighed down by heavy calories or in a carbohydrate induced fog? Salad suppers are a perfect solution and this one in particular satisfies on all fronts, especially with the one, two flavor and texture punch it’s packin’. 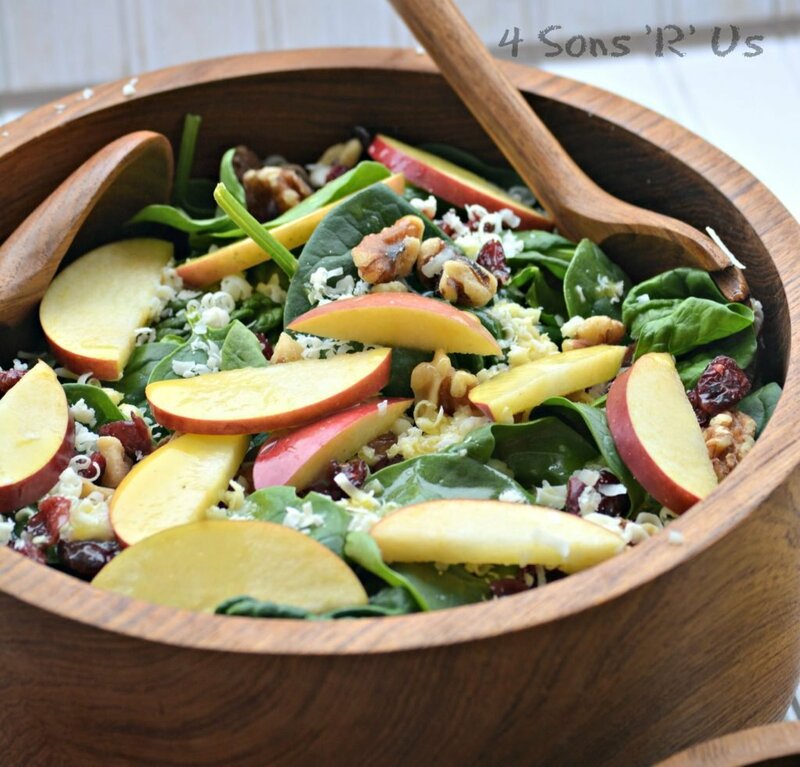 A perfect dinner salad that's loaded with good for you ingredients that work together to create a bowl full of fresh, green, crunch goodness. Add all the salad ingredients to a large bowl, in the order listed. Gently toss them to evenly combine and then set the salad aside. 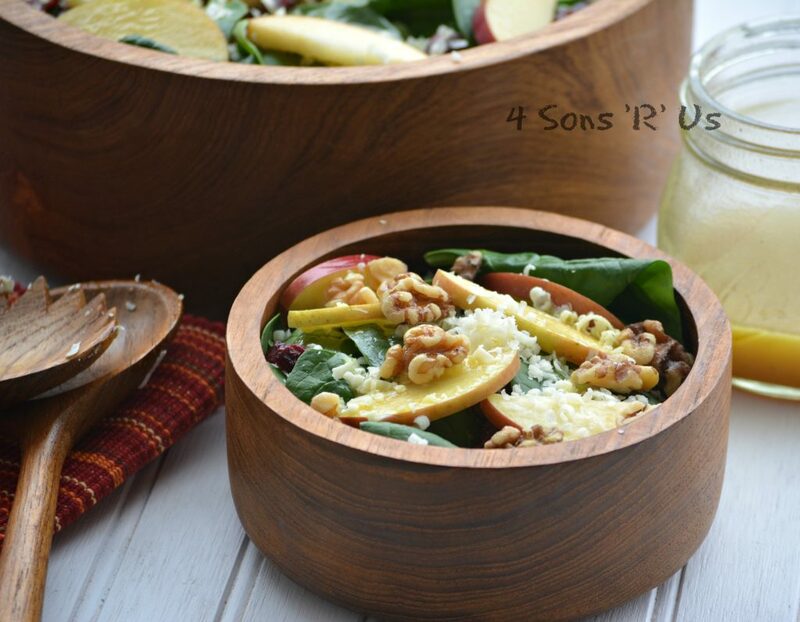 Add all the salad dressing ingredients to a small glass container or jar with a lid, such as a mason jar. Secure the lid, and shake well until the ingredients are evenly incorporated. Taste the dressing and salt and pepper as desired. Using as much, or as little, dressing as desired-- pour the vinaigrette over the tossed salad, gently stirring a bit to spread it around, and serve immediately. I didn't include it in the ingredients, but I did mention using pulled rotisserie chicken in the post and how yummy it is in this dish. If you want to pack a little extra protein into your meal, I'd suggest adding a heaping cup of cold, pulled rotisserie chicken and then using just a bit more dressing when serving. Alternatively, you can make the salad and serve as is and top each individual serving with equal amounts of the cold, cooked chicken. Sounds delicious and just the kind of light summer meals I like to plan. Thanks for the recipe! Sounds like an amazing (and easy) salad. I bet the apples and cheddar especially taste great together. Thanks so much for sharing at You Link It, We Make It! We so hope to see you back tomorrow!